I'm quite a picky person when it comes to an eyeliner. Up until now there aren't many pencil eyeliner that make me happy. When the last time I talked to my sponsor, Bell's Etude House, the owner Yessy said that Etude House Styling Eyeliner is one of their best seller for an eyeliner pencil. I saw this product a long time ago on Qoo10 but not interested to buy because it is pencil type. But, when I heard it is one of the best seller from my sponsor, I'm quite curious to try. Who knows I will found a new love. hehehehe. An automatic pencil eyeliner. You only need to twist the pencil to make the product come out. Surprisingly the color of this eyeliner is very black. Usually pencil eyeliner doesn't really provide black color on my eyes but this one is different. I really love the tip of the pencil, it is easy to use and glide on my eyes very well. Unfortunately this eyeliner isn't waterproof and it also smudge easily huhuhu. If you have double eyelids and dry skin, you maybe have no problem with this eyeliner. But for me, it's quite a problem. 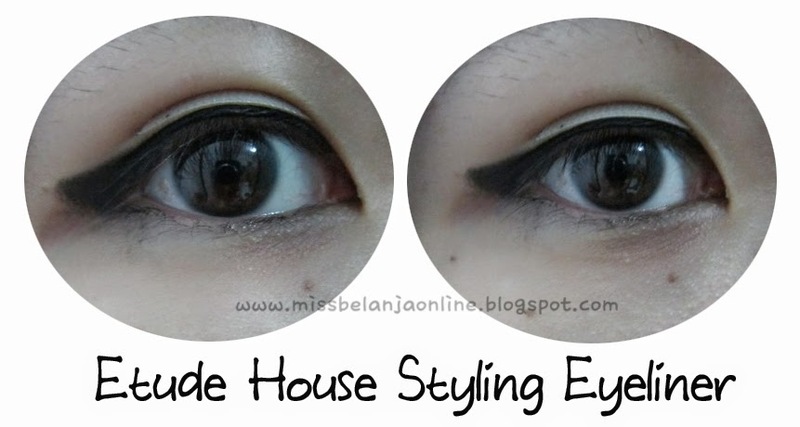 But hey, there's always another way to use pencil eyeliner~ I use this as an eyeshadow and love it to the max! especially to create a smokey eye make up. PS: I think this is more suitable for those who works in office rather than those who works outdoor. Also if you have double eyelids, you sure must grab this eyeliner. It is cheap and have a nice color payoff.